Among the suggestions, and later incorporated in a test vehicle were alloy rims for the 16 inch NDTT tires and an aluminum body. The resulting type accepted vehicle consisted of a sheet steel body that proved less than desirable in relation to corrosion resistance. However, this design did keep the design within total unit weight tolerances for air transportability. The reliability of the United States M151 series light tactical truck led to numerous variations and production models. In the original concept vehicle developed by the Ford Motor Company, it was suggested the engine be equipped with the ignition system sealed in a compartment incorporated within the cylinder head. Proving less reliable than anticipated, this aspect of design was dropped in the type-accepted model. Along with the general body style of curved rear wheel wells, other less apparent design changes were made where the vehicle was ultimately adopted as the M151. Later designers choose to retrofit solid steel bodies addressing three principle issues. Firstly, the body could be fabricated utilizing less sophisticated tooling. While labor intensive, the design fit neatly into the aspect of third world production where jobs were needed and labor expense less a consideration. Second, the design allowed a superior body in resistance to often-harsh environments as found in many third world countries. Third, the design was such that many countries could afford a larger fleet of a proven vehicle design, and a reduced maintenance ready capability. The M-151 was clearly designed to be maintained under field operating conditions. Balanced against the high initial cost and technician training required, the M-151 based vehicle was simply more cost effective for many fleet solutions. This particular version of the M-151 variant prototype incorporates the heavy steel construction and the updated composite lighting system. It is capable of supporting the same, and in many respects a larger variety of indirect and direct fire support weapons platforms. It is only one of few remaining examples and continues to suggest a solution for shrinking budgets and increased government requirements of many countries. 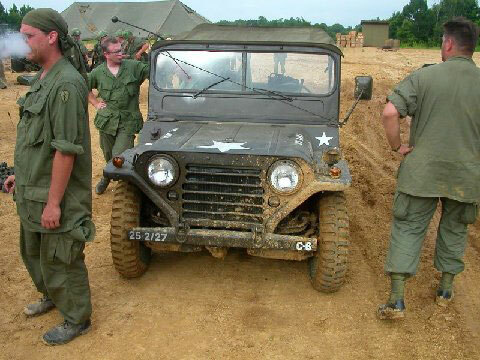 The United States military series of jeep known as the M151, came as a result of Ford Motor Company having been awarded the contract for development of replacement vehicles for the aging US military fleet of WWII and Korea. Begun in 1951, under a program known as the Military Utility Tactical Truck Project (MUTT), it became known as a most reliable vehicle suitable for multiple roles and applications. The MUTT became standardized for American and allied countries in 1960. Over 100 foreign countries use the M151 in their existing police and military forces. The M151 is a large departure from previous jeeps, both in looks and design. The M151 has a unitized body with a integral box frame. 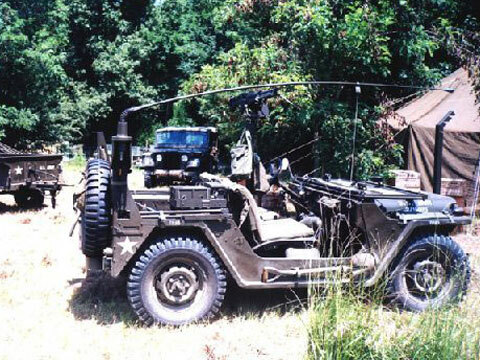 It is the same weight and an World War II jeep even though it is a larger vehicle. It has a longer wheelbase, is wider and is lower than the military version of the CJ-5 which was known as the M38A1. During the course of its early production, the M151 gained a reputation of 'rolling over' in a certain situations. One report states, "that in fiscal 1967, the M151 was involved in 3,538 accidents that resulted in 104 deaths and 1,858 injuries." The primary factors that came from the 1967 study suggested three 'core' contributory issues. The vast majority of person in the U.S.Army were young men who were drafted - not career soldiers, thus there was a 'care less' attitude. Additional contributing factors suggested was the vehicle having been designed for OFF ROAD USE as its primary mission. The tires used by U.S. and many allied forces, are of the Non-Directional Tread (NDT) type. Simply stated this means there is no specific tread pattern - the tire is made for gripping soft soil or wet unimproved surfaces. Operators of the M151 displayed a propensity for application of civilian automobile handling characteristics in their driving habits but in fact were using a primarily off road vehicle with no tread on the tires. An 'A' arm with a coil spring is used on each wheel. The M151 and the M151A1 have the pivots on the inside of the wheel. The M151A2 changes the rear 'A' arms to pivot front to back. This greatly reduced the tendency to roll over in a high speed turn. 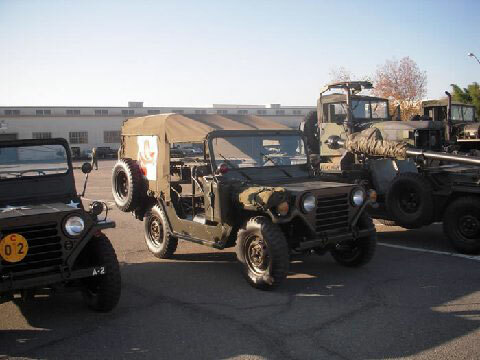 - 1950 Continental Army Command places requirement for a new's ton 4x4 with the Ordnance Corps. - 1951 Ford Motor Company awarded the development contract for the new vehicle. - 1952 Ford Motor Company produces the first prototype. - 1954 Ford Motor Company produces the second prototype called the XM151. + XM151E1 - aluminum body. - 1959 The Ford Motor Company prototype XM151E2 chosen for production. 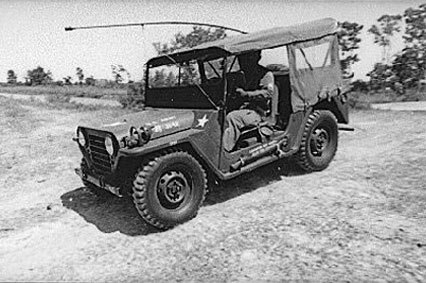 - 1960 The United States Military jeep, model M-151 begins production. - 1964 Concluding the review of data collected from military units changes in the production took place resulting in a refined version of the jeep that was type accepted as the model M-151A1. - 1970 With additional data being made available from users in the field, additional changes were undertaken resulting in the last and final model to be type accepted. This last model was known as the M-151A2. - 1978 Production of the M-151 series jeep is halted as the new series of tactical military vehicles is adopted. Weight - Engine w/flywheel & acc. 328 lb. 148.9 kg. Cam Angle 39 - 46 deg.